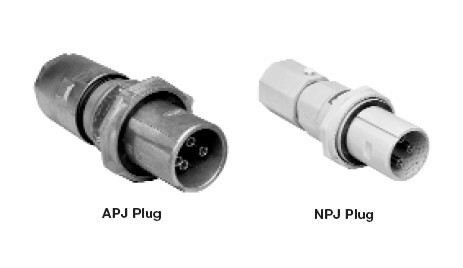 Receptacles are mechanically interlocked with circuit breakers to provide disconnect means, short circuit protection and thermal time delay overload protection. Enclosures are compact and rectangular in shape permitting close spacing. For maximum safety, the spring door receptacle at the bottom is mechanically interlocked with the circuit breaker operating mechanism. The circuit breaker cannot be closed until the plug is fully inserted and the plug cannot be withdrawn unless the breaker is open. Operating handles can be padlocked in either “ON” or “OFF” positions. Breakers are trip-free of the handles and will open under short circuit or overload even if the handle is locked in the “ON” position. Enclosure is provided with a drilled and tapped conduit opening at top center, equipped with a threaded-in bushing. The size furnished is 11 /2″, and removing the bushing permits the use of a 2″ conduit. Download the DBR Interlocked Arktite Receptacles With Enclosed Circuit Breakers spec sheet below or call 714.835.6211 for more information.